The head of the Oriental medicine community pledged to have local Oriental medical schools get listed on the World Directory of Medical Schools (WDMS) again. Korean Oriental medical schools were delisted from WDMS in 2012. Choi Hyeok-yong, president of the Association of Korean Medicine, said Oriental medical schools should be included in WDMS so that Korean Oriental medicine practitioners can provide medical care in the global market. Choi Hyeok-yong, president of the Association of Korean Medicine, speaks during a news conference at the association’s office in Seoul, Thursday. “It’s an issue that can decide whether Oriental medicine practitioners will be recognized as physicians or just acupuncturists. Graduates from schools on the list of WDMS are recognized as physicians that went to a medical school,” Choi said. 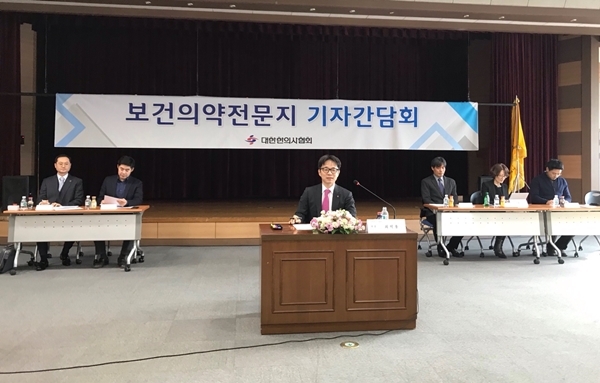 While an Oriental medicine practitioner works as a physician in Korea, not being approved as a physician in other counties could hurt Korea’s global competitiveness, he said. “The Korean Medical Association is blocking the re-listing of Oriental medical schools on WDMS. This is a wrong act if we are to work for a greater cause,” Choi added. Choi argued the World Federation of Medical Education (WFME), which grants certification, listened to the Korean Institute of Medical Education and Evaluation (KIMEE) only, instead of the Korean government. According to Choi, the Ministry of Health and Welfare has regarded Oriental medicine practitioners as physicians in the early 2000s. “Health and Welfare Minister sent an official letter (to the WFME) to demand the re-listing. However, the WFME is listening to the KIMEE only. It doesn’t pay attention to the government’s stance,” Choi said. There was no reason why Korean Oriental medicine schools had to be removed from WDMS because those in Mongolia, Hong Kong, and China are all included, he added. Choi said he would seek reform in the Oriental medical schools’ education curriculum and benchmark the U.S. system of giving Doctor of Osteopathic Medicine.